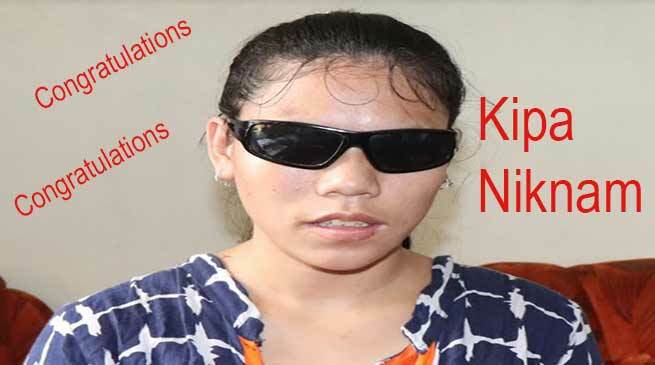 Kipa Niknam, a visually impaired Arunachalee Girl reaches among top 12 in Sa Re Ga Ma Pa reality show. Niknam, an Arunachalee girl who qualified to one of the top singing reality show being screened by Zee TV ‘ Sa re ga ma’-2018 wherein out of 24 she qualified all hurdles to reached directly in top 12. Speaking to Arunachal24, Niknam said that “I being a Divyang, a dropout of the DPMSH&VI school, Chimpu having hope, aspiration and faith on the training which I have learned from her music teacher Pura Yallo and support of Principal H Sharma and other teachers and staffs of the school and, today i got an opportunity to reach the famous singing talent show which would be performed at Mumbai from September 9 onwards” . She said singing was my hobby and reached to this status when I was selected from the school to perform in School function and also participated in various small and big event and even at state level like state hood day celebration in 2013 and 2015. Her singing journey began in 2012, from her school, Arunachal Got Talent (AGT) 2013, Arunachal Idol-2015, able to get opportunity to sing at various platform and have lots of song recorded as albums with the help of Director of Youth Affairs D K Dinglow and now she will sing on behalf of 14 lakhs people of Arunachal Pradesh. Like other star from state like Jelly Kaye-Indian Idol-2017 and little master Tamman Gamno in Dance India Dance-2018 (DAD) , she also want to bring laurel and name and fame for the state, for which she need lots of support and love from all section of society so that she could perform well and excel in the competition in the reality show. Her selection process for Sa re ga ma began on August 14 through online registration and she was unaware of the such registration and singing talent show audition, her song through video calling was liked by one of the judge Mika Singh and she was called for audition at Guwahati and the journey began to Shillong on August 17 and Kolkatta on August 20 and later she reached to Bangluru to participate at 4 and 5 level on August 27 and 28 respectively and now she will be going to attend the level 6 and she is at top 12. She said. Niknam can sing in both male and female voice which has made her different than other normal singers and it is a pride for the people of state that a divyang is attending to reality show and we as a common man should support her in her endeavour. She said that she is 18 year old and 8th child of Kipa Kame and Kipa Sangte at Sango village in Phassang Circle of Kurung Kumey district. She have 4 brother and 4 sister including herself. Her family condition was not so good. DPMSH&VI Principal H Sharma also interacted and said that Niknam was admitted in 2012 as a late student and continue the regular school till 2016 up to status of Class V and now she can study as a dropout students through NIOS and we have planning for her further education so that she can earn her bread and butter of her own like many children of the school are doing. Sharma said that she have got training of brail and training of mobility, she have determination but need support and appeal all section of people to extend blessing to her so as she could win the race and bring a title of winner to the state.